The web site and its contents are cited in this report with the kind permission of Steven. The most striking memorial is probably The Altar of Remembrance, currently housed in The Memorial Chapel, which is located to the left on entering the main body of the church. 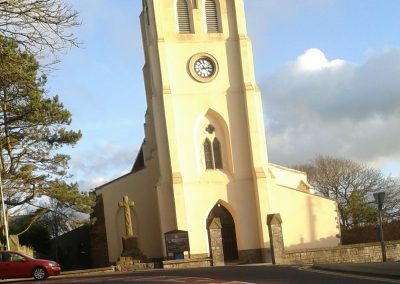 (The photo below shows the gates to the Memorial Chapel.). 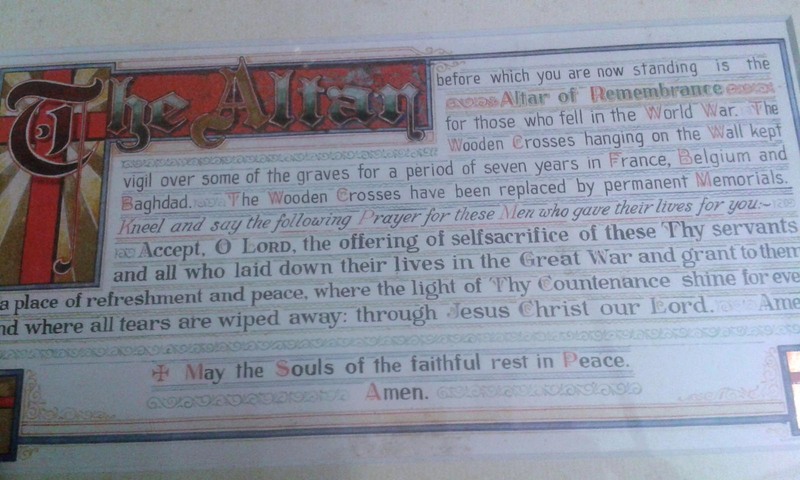 A framed notice (photo below) outlines the rationale for the Altar stating that “the Wooden Crosses hanging on the wall kept vigil over some of the graves for a period of seven years in France, Belgium and Bagdad—–”. 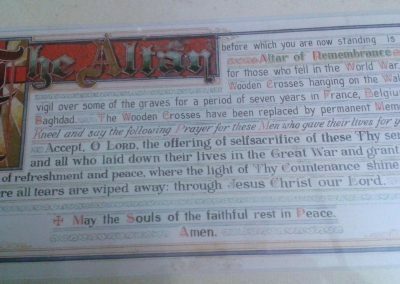 This would cross-reference with material held in Pembrokeshire Record Office, and kindly supplied by the ex-archivist, which covers the dedication of the altar in 1924 by the vicar of St Katherine & St Peter’s, the Rev. Canon Edmund Howells. Inside the chapel, hanging from and propped against the walls, are 23 crosses- the majority of which are similar in design of white painted wood with black paint to the bottom stake section. 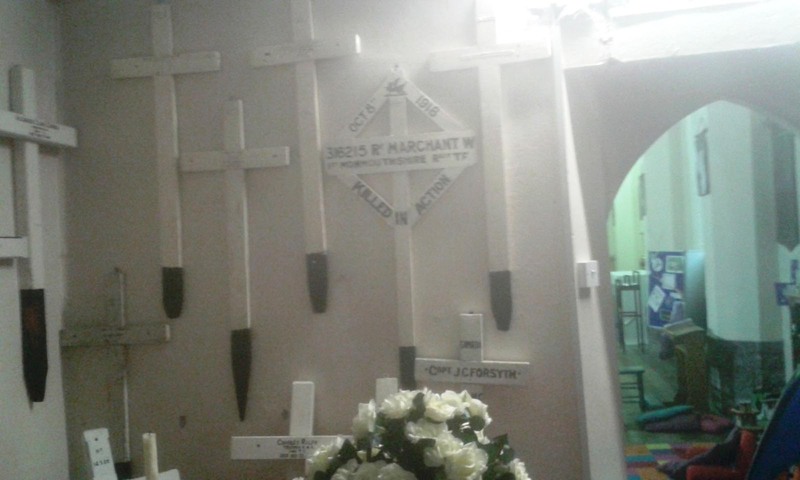 (Photos below show the crosses ranged around the Chapel walls). 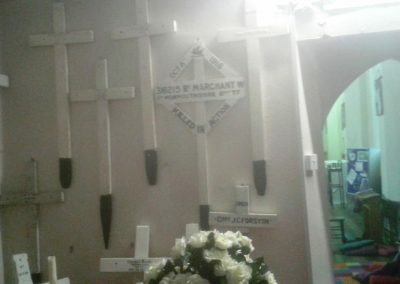 Of the 23 crosses, 9 contain GRU or aluminium name tags, with the remainder relating predominately to naval and merchant navy personnel lost at sea or soldiers returned from the front and subsequently dying from injuries. 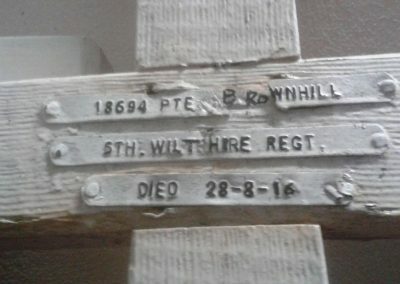 Details of all the individuals named on the crosses can be found at the link below—cited with permission of the author. 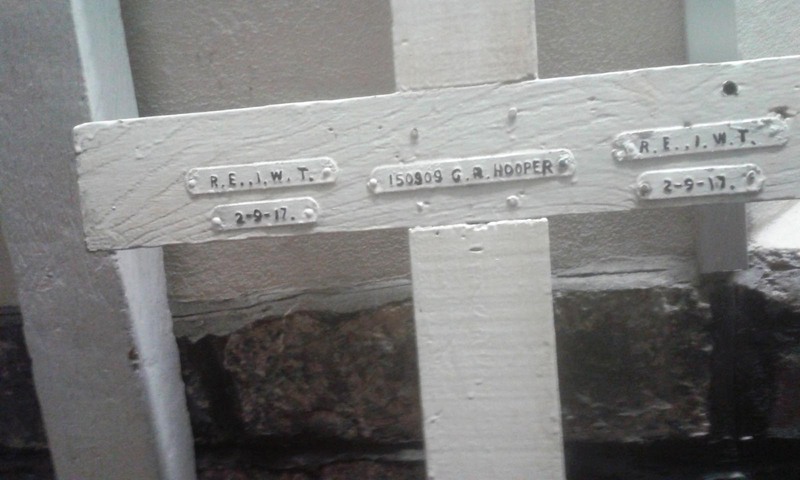 It is fair to assume that the crosses containing GRU tags or aluminium tags are original battlefield crosses, although many of the tags have undergone restoration and over-painting. 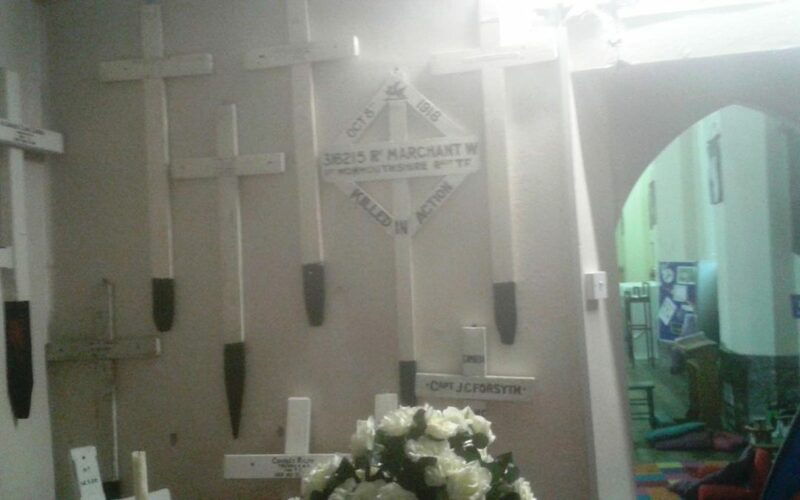 In addition, 2 of the crosses were located too high on the wall for measurements etc to be taken, (see photo below) so the report below covers the 7 crosses which were accessible. 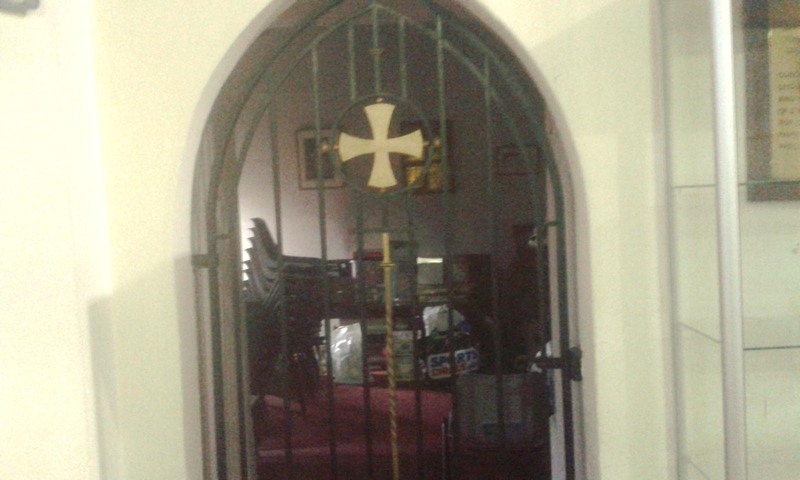 The cross is currently free-standing against the wall, although there is a hook affixed to the reverse. The cross is over-painted white with black paint to the bottom stake section and the aluminium strips bearing the details have been over-painted and restored with black paint. 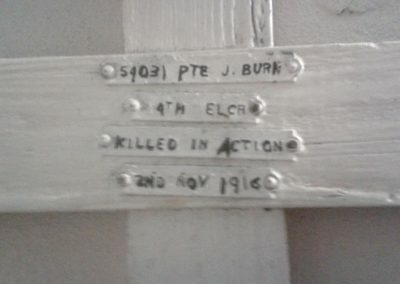 (see photo below for details) Given the over-painting it was not possible to state whether the cross has been inserted in the ground or to state the condition of the wood underneath the paint. The cross is currently free-standing, but there is a hook for hanging affixed to the rear. 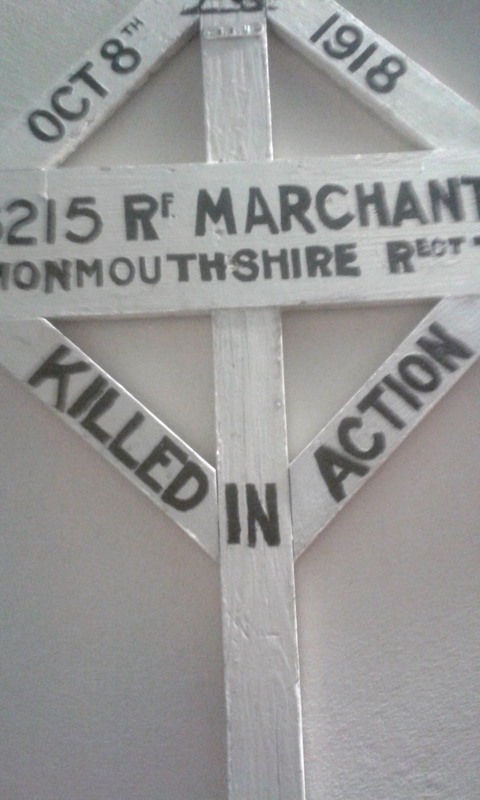 The cross is over-painted white with black paint to the bottom stake. 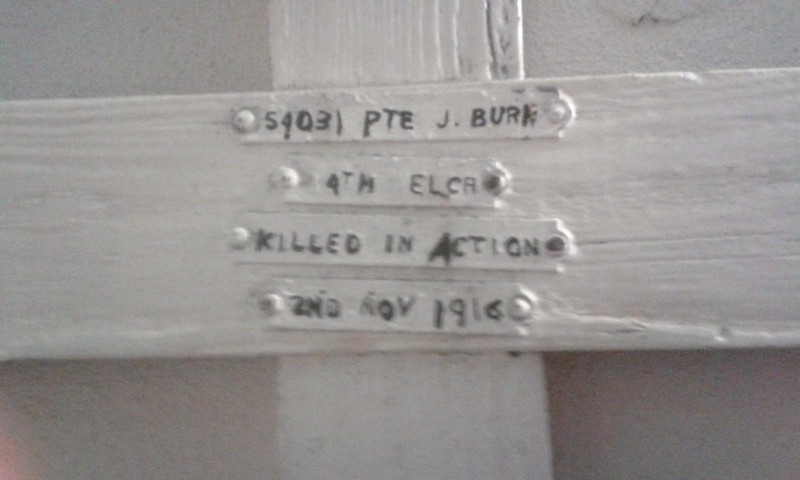 The aluminium strips bearing the details have been heavily over-painted and restored, and whilst the name cited on the aluminium strips reads BURN, the actual name, as revealed through reference to CWGC data, is BURR. It was not possible to state the condition of the wood under the over-painting or whether it had been inserted in the ground. The cross is affixed to the wall with a hook, and is over-painted white with black paint to the bottom stake. 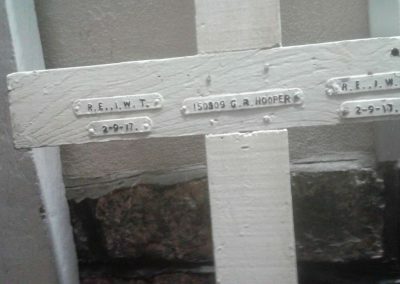 The aluminium strips bearing the details have been over-painted in black paint but there is no sign of restoration to the actual strips, unlike some of the other crosses. It was not possible to state whether the cross had been inserted in the ground due to the over-painting. The cross is in poor condition with obvious signs of rot and mould developing on the surface despite the over-painting. This could well be the consequence of the dampness within the Memorial Chapel and evidence of water penetration within the walls. 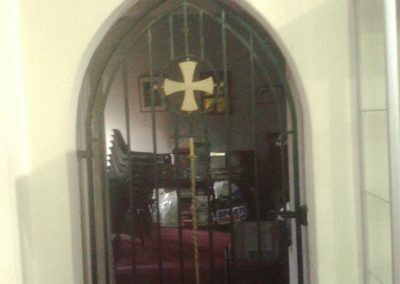 Of note is the fact that some of the crosses have been removed from the walls-evidenced by the outline of crosses on some of the walls. Strip 5: Below RE…IWT, 2-9-17. Additional information: The cross is currently free-standing, but there is a hook for hanging affixed to the rear. The cross is over-painted white with black paint to the bottom stake. The aluminium strips bearing the details have been over-painted. It was not possible to state the condition of the wood under the over-painting or whether it had been inserted in the ground. The cross is affixed to the wall with a hook, and is over-painted white with black paint to the bottom of the stake. The aluminium strips bearing the details have been over-painted in black paint. It was not possible to state whether the cross had been inserted in the ground due to the over-painting. The cross is in poor condition with obvious signs of mould developing on the surface despite the over-painting. 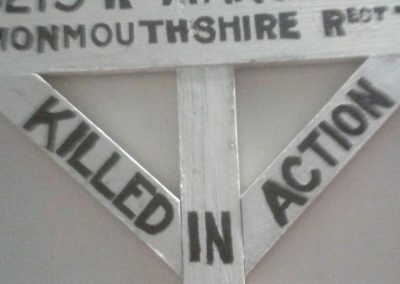 At the head of the cross, engraved emblem of the Monmouthshire Regiment, The Dragon, etched in black. 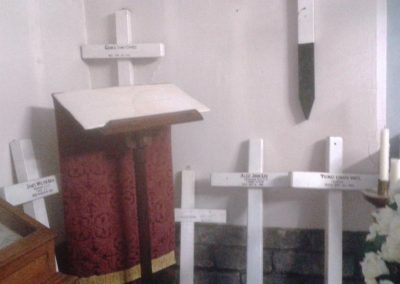 The cross is affixed to the wall with a hook, and is over-painted white with black paint to the bottom of the stake. It was not possible to state whether the cross had been inserted in the ground due to the over-painting. To the right of the strip there are 2 distinct screw holes, which look relatively recent. 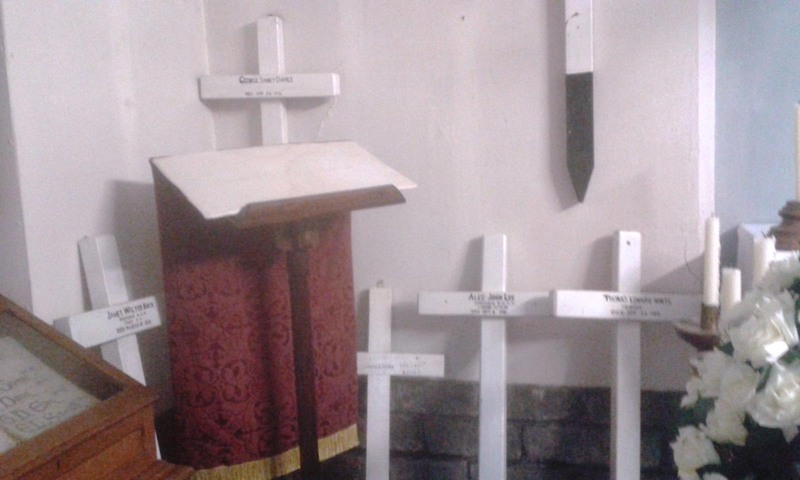 The cross is affixed to the wall with a hook, and is over-painted white with black paint to the bottom of the stake. It was not possible to state whether the cross had been inserted in the ground due to the over-painting. The cross is in poor condition with obvious water penetration and mould to the reverse. 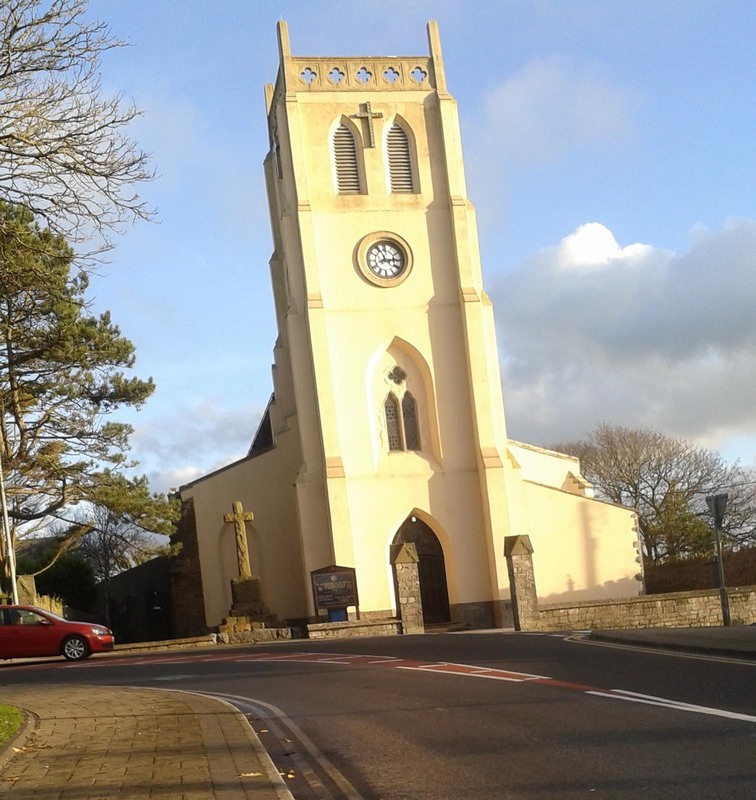 Further bibliographical information can be found on the West Wales War Memorial Project web site, which is cited in the introduction, along with details of the other WW1 memorials within St Katherine and St Peter’s Church. 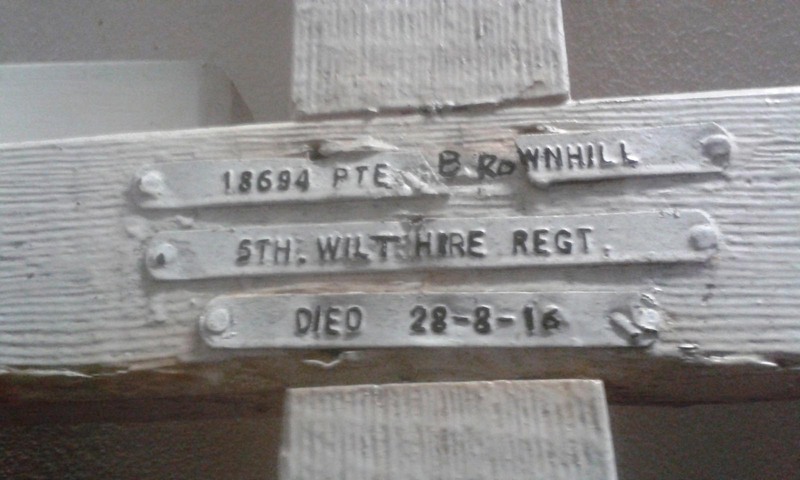 There are an additional 2 battlefield crosses within this church, which it was not possible to survey given their location high up on the Chapel walls.